Central sleep apnea is a dangerous medical condition wherein because of damage to the brain stem (which controls respiration in humans) your new born baby or young one may stop breathing for more than 20 seconds a event known as an apnea. 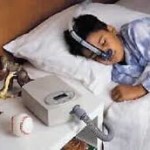 While it also occurs in adults, central sleep apnea in children is much more dangerous because of the increased risks of serious secondary medical conditions which can be caused by sleep apnea. 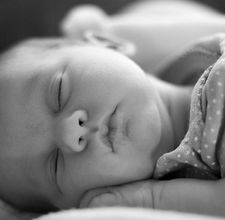 Is your baby suffering from Central Sleep Apnea?. Gagging: When any human stops breathing for a long period, the body will naturally start to gag to try an induce respiration. The same occurs in babies and children, after a few apnea attacks, when the oxygen concentration reduced to very low concentrations your baby will start to gag or gasp. If it happens only once or twice, there is no need to worry, but if you notice gagging every time your child sleeps, then you need to visit a doctor. Colour Change: When central sleep apnea is severe, due to continued obstruction of the air tract, the oxygen concentration in the blood stream will be lowered to extreme conditions a condition known as asphyxiation. When this occurs, the colour of the skin will slowly turn to blue. If this occurs near the temples and body, immediately call an ambulance and if you know CPR, perform it continuously until emergency personal arrive. However the skin around the feet, hands and mouth turn blue naturally at times. Only if the temples and main body turn blue is there cause for concern (if only the hands and legs, monitor your child continuously for a minute, if breathing is still not normal, call the ambulance). Other than the above you may notice that your child’s breathing changes over time a phenomenon known as periodic breathing where the breathing will be high for a while, followed by breathing at a slower rate which is finally followed by pauses in breathing for up to 15seconds. This is normal in babies younger than 6 months, so there is no need to worry. Drugs, Toxins: Exposure to toxins or drugs may damage the brain and cause central sleep apnea. Prematurity: This is one of the most common causes of central sleep apnea. If your child was prematurely born before 37 weeks of pregnancy, the chances of central sleep apnea are drastically increased because of the lack of development of the brain and other organs. While this condition is also found in babies born after 37 weeks pregnancy, the chances of central sleep apnea occurring are low. So definitely be more attentive to the body language and signs of the baby and especially if there is a suspicion of possible central sleep apnea problems.